Flat facial feature includes pretty-blue eyes, a finely contoured mouth and appropriate nose, along with painted blonde hair with nicely painted and detailed curls. 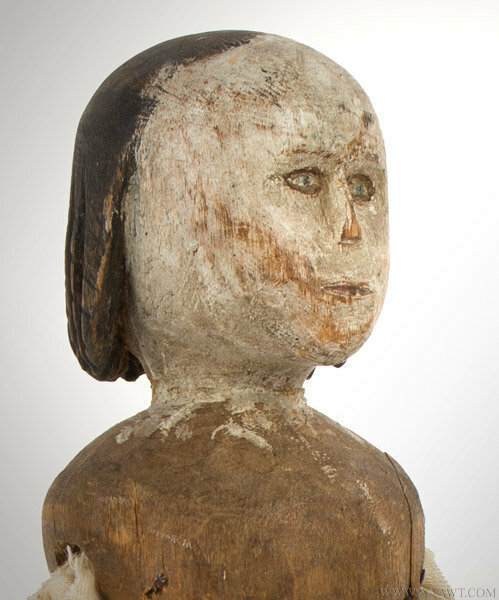 Minor paint cracking on the head here and there, but not affecting appearance or facial features. 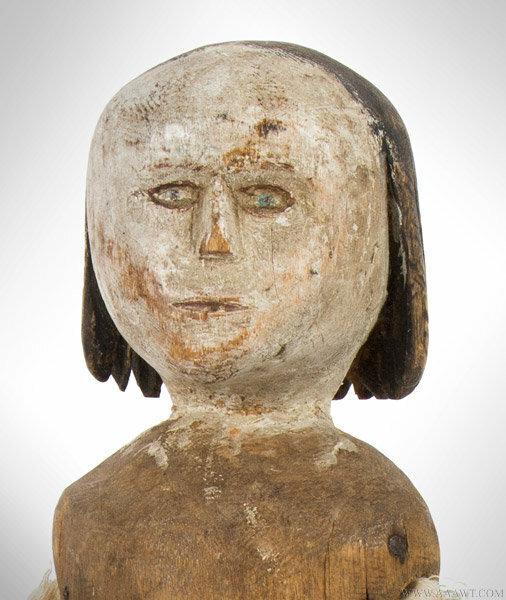 The facial features remind us of the early commercial cloth dolls, with the painter/maker likely influenced by "Miss Columbia" or the early painted Babyland Rags. While not an exact copy, a charming "cousin" of the country ilk. 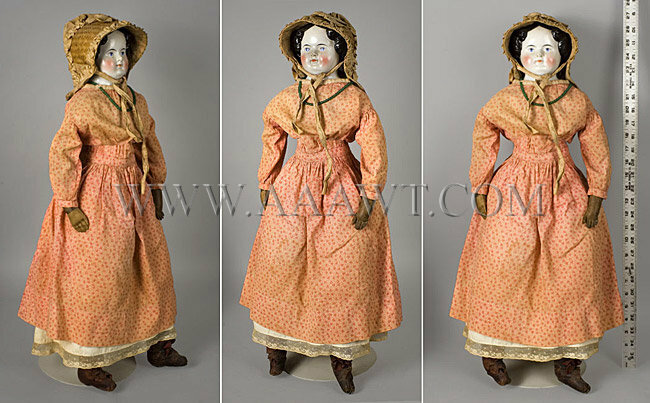 Cotton body (machine stitched) with sturdy oil painted head, face and hands with articulated fingers and thumb. Feet are not painted, nor do they have stitched or articulated toes. Wearing a nicely fitted undershirt, chemise with trim, and slip with fine trim. Needing just the right dress, shoes, and hat to give her right finishing touches. 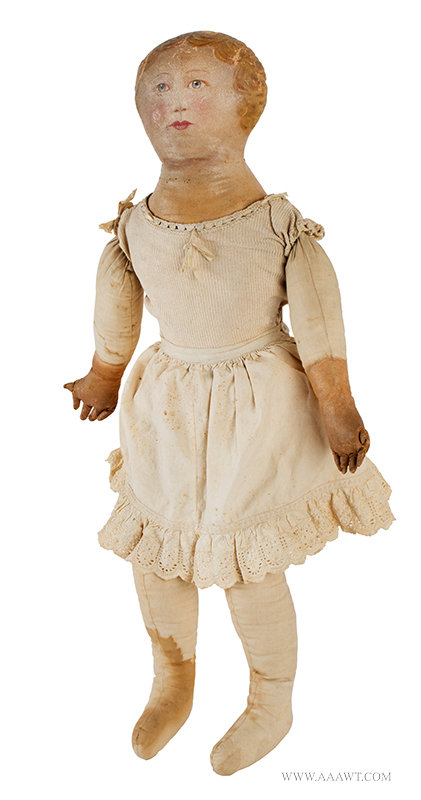 Accompanied by a note " Doll was given to Eleanor Smith by Great Aung Florence Flanders when Eleanor was under 10 years old. It was 40 years old then". 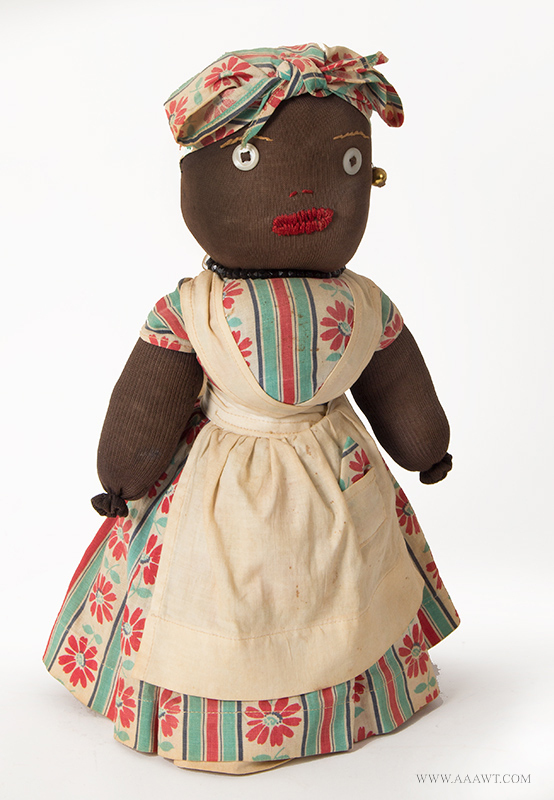 Folk art Mammy, stuffed black doll mounted on large weighted bottle; knit stocking head and body mounted on sand-weighted milk bottle. This gal with stitched features wears a printed dress and cap, apron, and petticoat; she wears a glass bead necklace and is in fine condition. Five piece French type body, possibly for French Market, remaining in excellent condition. 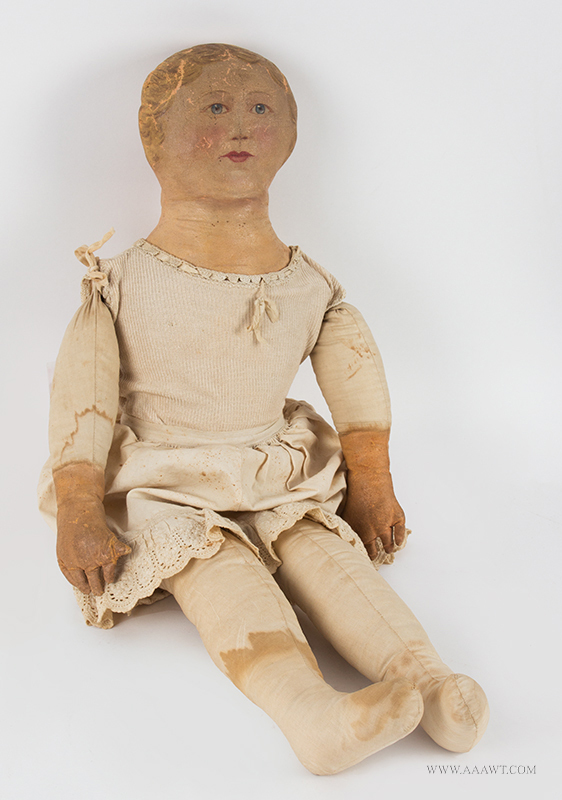 Stuffed baby body, compo hands, and excellent condition. China Head black lights perfectly, and has been on this body for over 100 years. 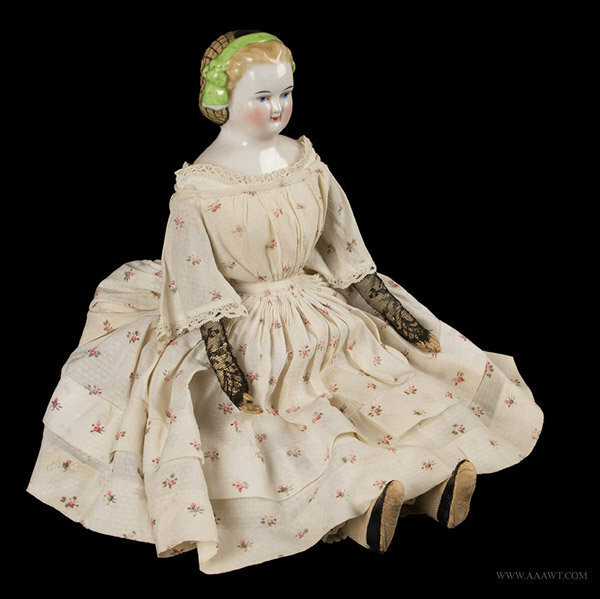 The wooden bodies are more commonly found on dolls of the 1830s-50s, making this a transitional match. 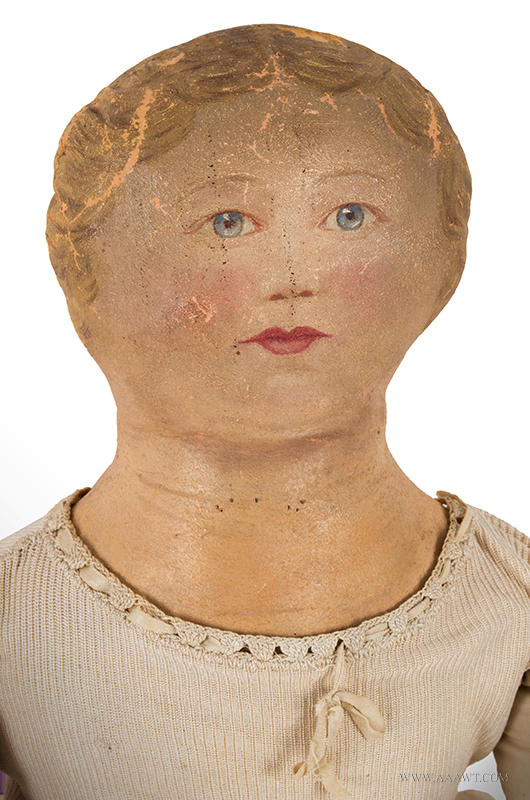 Head had desirable pink tint, blue eyes, pull back hair with bun in back and a most wonderful complexion. 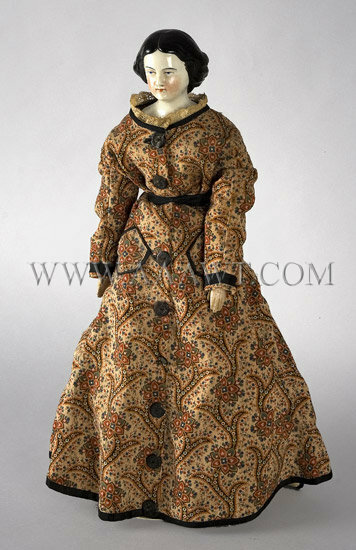 Dressed in a 1860s/70's era dress, possibly original to the doll. 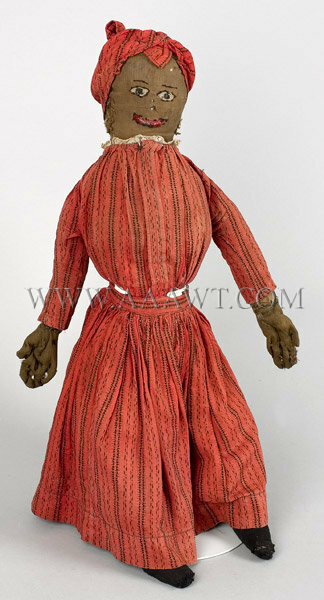 Overall, an uncommon doll in excellent condition. Measures 19.25" in height. 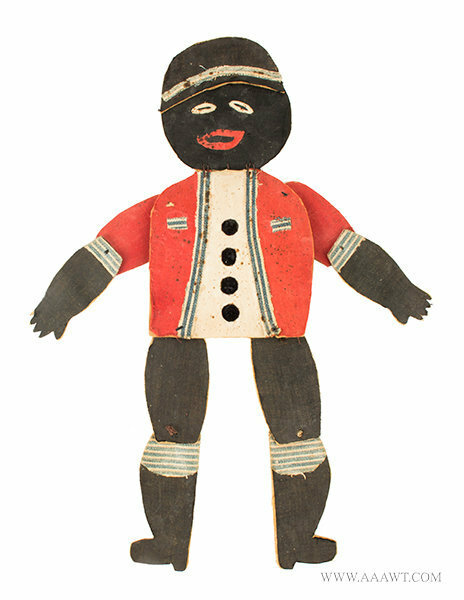 A doll made as a teaching aid for children to learn about lacing and tying. Measures 12.25" in length. 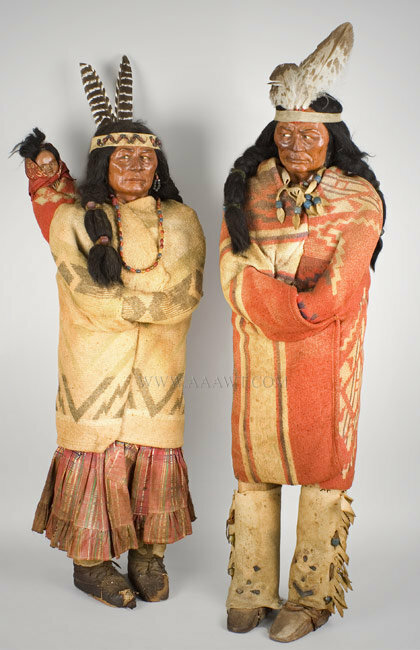 All original 35.75" male, 33.25" female and 8" child dressed in Navaho style blankets and period clothing. 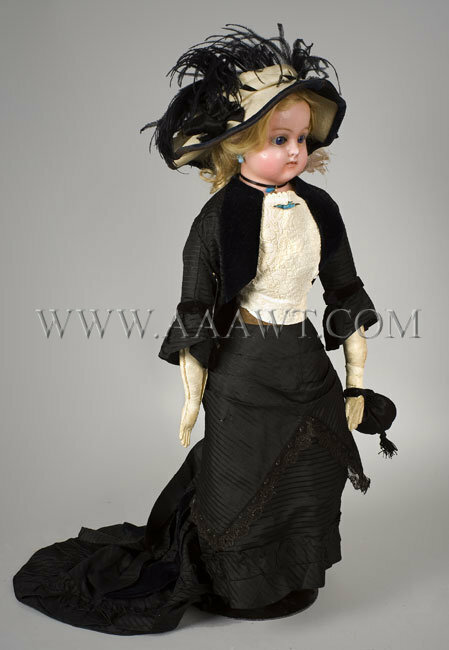 Dolls have composition faces showing great detail and cloth bodies. 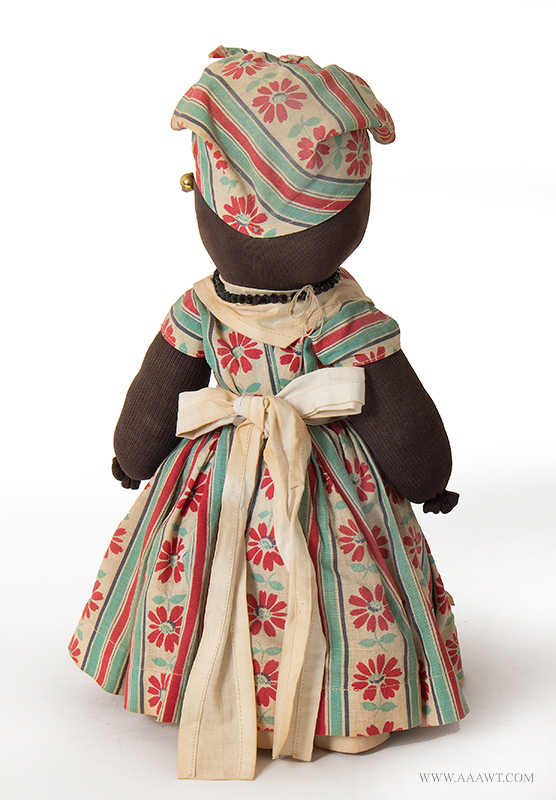 An early American rag doll that resembles the rag doll patterns that were first printed in the 1830's. 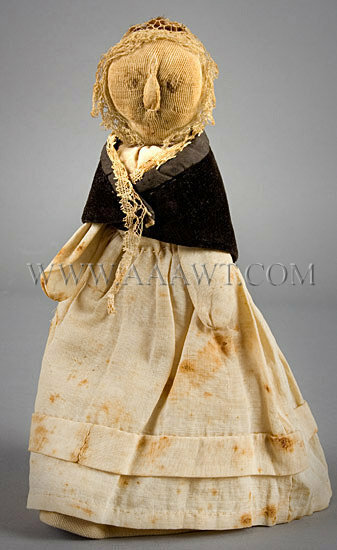 She measures 7" and is made with a rolled cotton body without arms or legs...it is the most simple of forms so that a child could easily make her own doll with small pieces of fabric. 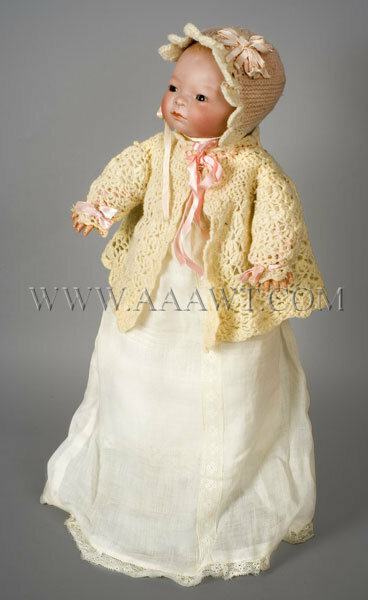 Her head is stuffed stockinet with a pinched nose, silk hair and a net cap that was fashionable at the time. 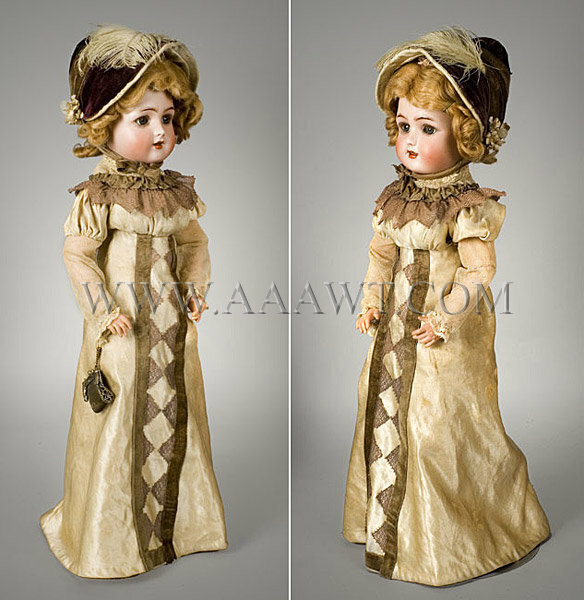 Her cream colored dress and underclothes are all original and hand sewn. 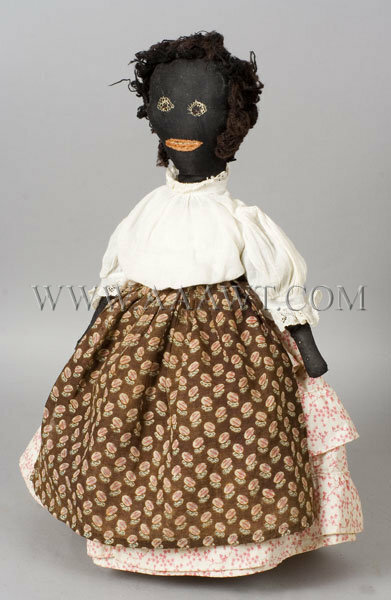 A rare survivor and a great addition to an American doll collection. Embroidered features and appropriately dressed in old clothes, remaining in excellent condition. Doll approximately 17" L, chair approximately 11.5" H, spinning wheel approximately 9" H. Doll has porcelain head, arms and legs w/ overglaze black enameling; painted eyes; blue and white gingham dress with MOP buttons, upright spinning wheel has working treadle; seat and back of chair are upholstered in paisley fabric. 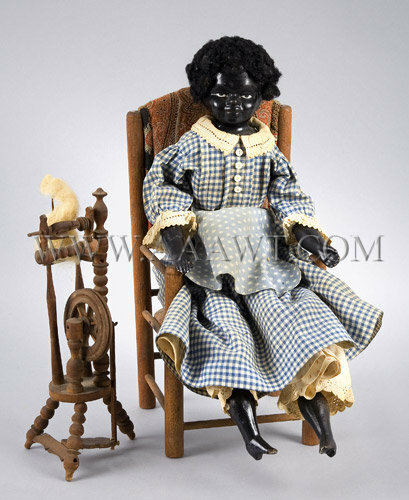 Chair and spinning wheel in very good condition, dolls head has vertical crack running from forehead down, hair appears to have been added, small chips on tips of toes, chips on back of right calf. 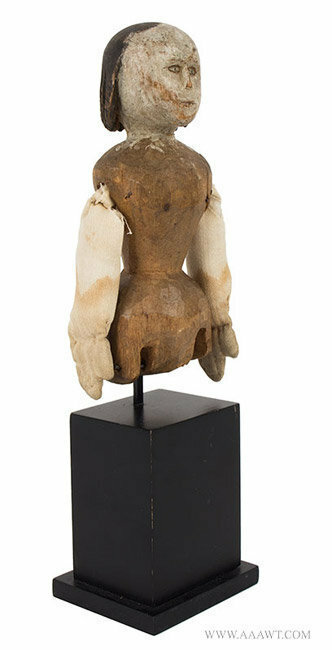 Note: doll's head is damaged, with wig covering major loss. Sold as a 3-piece grouping only.